The MIR Short Weighted Vest is a fantastic short weighted vest that is perfect for people who want to do cross fit workouts are their regular training exercises or anyone who wants a weighted vest that provides complete mobility but is able to adjust in various weights. The vest contains iron compressed bars so you can be assured they will not leak anything. Short on Time ? >> See the best price for the MIR on Amazon here. MIR is famous in the crossfit world for using it with exercises like deadlifts, squats, box jumps, pull-ups, chin ups and all the other crazy type of exercises that sports demands. 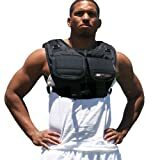 With that said it will work awesome for anyone else who wants to use it in their workouts with out restrictions and wants a vest that will last! The vest has a lifetime warranty, it’s made of 1200 D Nylon which is super strong and durable making this vest made of Grade A quality. The shoulders and bottom of the vest totally adjust so you get a really snug fit so the vest does not move around while working out. Please note: You need to user your own weight with this or purchase the extra add-on weights. People really get confused about this when they purchase it. If you are in a hurry? You can click here and go straight through to Amazon now to check out the full product listing and what people are saying. With the MIR Short Weighted Vest it can hold up to 40 pounds of your own weight you have to secure in it. You have to provide your own weight with the short model. If you want a MRI weighted vest with the weighted included you need to look at the 50 lb MRI Vest model. You also get one Velcro belt included to be able to strap the weight on. You will also get into compartments to store additional weights there is also double padding throughout the best in the narrow shoulder design so it will remain fairly comfortable. So the only word of caution here is that if you have a big upper body it might be a tight fit on you or you need to consider another vest. However this is not a beginner weighted vest or light weight vest. If you are looking for something that is a bit more for beginners you should check out some of our lighter weighted vests. You will also find that this is super compact and it is any 11 inches in length so the design is made for maximum mobility and to give you a snug fit. The weights are loaded at the upper body and the front and the back weight distribution for optimum performance! This was designed for someone who is looking to add weight to their existing agility routines, sprint workouts, cross-fit workouts or running workouts. It would be great for high school athletes that are looking for an edge that will put more resistance into their workout without the expense of being mobile and agile to do exercises with their upper body. Now, if that is not what you were after and you wanted something more standard then look at this best selling Cross101 weight vest here. If you are looking for heavy weighted vest than this is definitely well worth looking. The customer reviews are very good with most people given this five star feedback. The any downside that we could see in the reviews were that people have said that this is quite narrow shouldered and if you have wider shoulders you may find it a bit of a tight fit but it is definitely worth a look if you want something that is really heavy and brilliant for weight lifting! You also need to use your own weights which could be an issue for some. Make sure this is the style of weights you want to use with it. I’m guessing most of you will want the weights include and wont’ want to use your own. In that case, you want to look at the HumanX vest or VForce Vest that has excellent mobility for Crossfit and the weight is included.